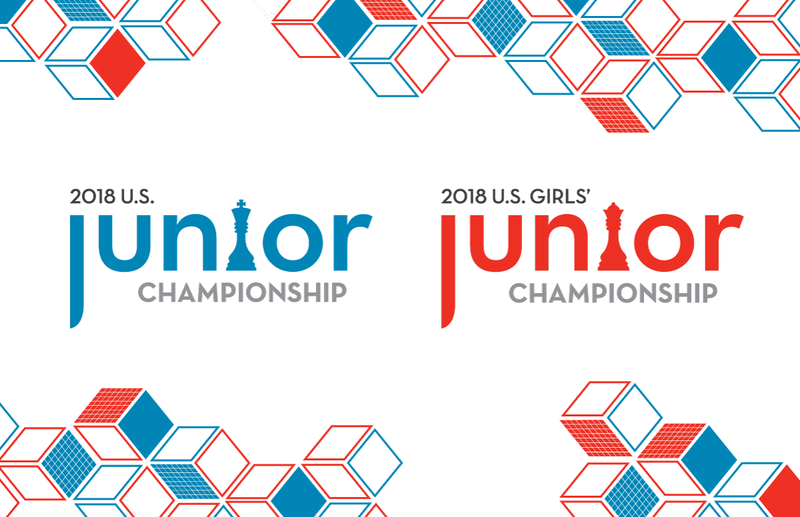 The 6-way tie for 1st in the Junior section disappeared as quickly as it appeared—with Awonder Liang emerging as the sole leader. In the Girls section, most of the leaders won, allowing Carissa Yip to maintain her half point edge. 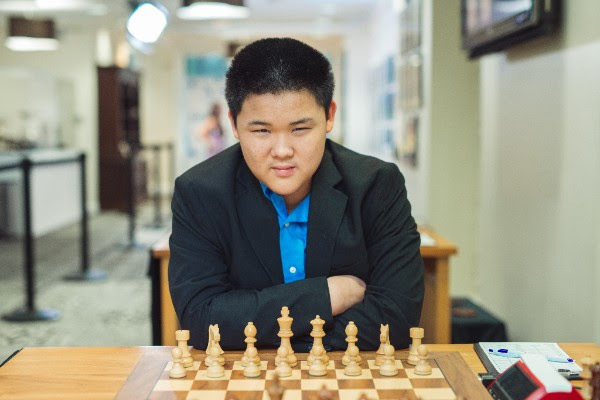 Awonder Liang played a skillful game to defeat co-leader Alex Bian. Liang played in a dynamic style, replying to Bian’s attack on his knight on c4 with a stronger counter-threat. At the end of the tactical sequence that arose, Liang obtained great control of the dark squares and an extra pawn, which he swiftly guided to victory. 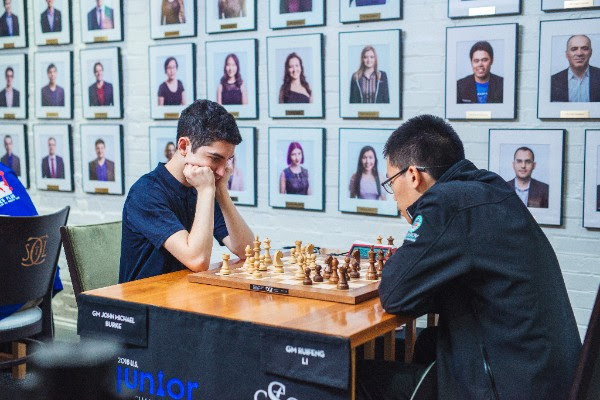 Ruifeng Li earned his first victory of the championship against John Burke. He began the game in his usual unorthodox style with the Hippopotamus Defense. In the middlegame, Burke obtained an edge by creating pressure and gaining space on the queenside. However, he missed a key opportunity to create a protected passed pawn with 33. c6. Later, Burke sacrificed a knight to break down Li’s center, but Li was able to activate his extra material and gain the upperhand tactically. Annie Wang had Akshat Chandra on the ropes this round! Chandra developed an edge by advancing his d-pawn through the center, but he gave Wang an opportunity when he loosened his kingside with 29...g5. Wang was up to the challenge and seized the initiative, activating her pieces by gaining tempi on Chandra’s queen. Through tactical means, Wang won two pawns and entered a winning endgame. Chandra was able to fight back, though, by mobilizing his pieces and passed a-pawn. The players ended up drawing by three time repetition. Advait Patel had excellent chances to win for most of the game against Andrew Tang. In a Ruy Lopez, Patel gradually gained an edge due to his more active pieces, greater space, and superior pawn structure. Tang gave up an exchange to get rid of Patel’s passed b-pawn and well-placed bishop on the c6 outpost. 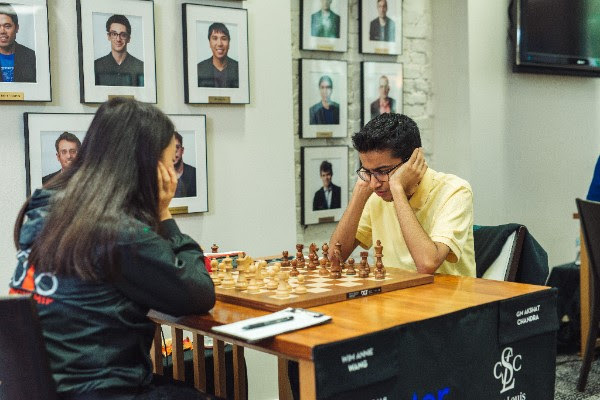 A clean exchange ahead, Patel looked to be cruising to victory when he fell into “the only trick in the position,” according to GM Hess. Because of tactical threats against his king, he had to give back the exchange. Though Patel still had an extra pawn, his king was too loose, and the players soon drew. Praveen Balakrishnan vs. Mika Brattain was the longest game of the round. In the opening, the players traded into a queenless middlegame. Although each player had a pawn edge at different points, the position was very level throughout. They fought for 93 moves. Balakrishnan especially hoped to win as the last player able to tie with Liang for the tournament lead. Ultimately, neither was able to convert. Heading into the penultimate round, Awonder Liang leads with Akshat Chandra, Advait Patel, and Praveen Balakrishnan chasing him, half a point behind. Will we have a repeat U.S. Junior Champion? In Sophie Morris-Suzuki vs. Jennifer Yu, both players played aggressively from the start. In tune with the King’s Indian Defense style position, Yu advanced on the kingside early in the game with ...f5. Morris-Suzuki countered by pushing pawns to both f4 and g4 and then sacrificing an exchange for a pawn. Yu defended well, and, after Morris-Suzuki’s attack was tamed, Yu activated her pieces and began her own king hunt. Yu chased Morris-Suzuki’s king to f3 before trading into a piece up endgame. Martha Samadashvili vs. Carissa Yip began as a calm Italian game until Samadashvili tossed out an aggressive g4 pawn thrust on the kingside. Her aggressive play, however, ended up weakening her position, and Yip asserted pressure in the center to win an exchange. After a complex struggle, Yip converted her material edge into a win. A French Tarrasch turned into a wild king run in Maggie Feng vs. Emily Nguyen. On move 14, Nguyen chose the brave yet accurate Ke3! to get her king out of check in the opening. Despite Nguyen’s centralized king with many pieces still on the board, Nguyen had an advantageous position because of her hold on the center and kingside. 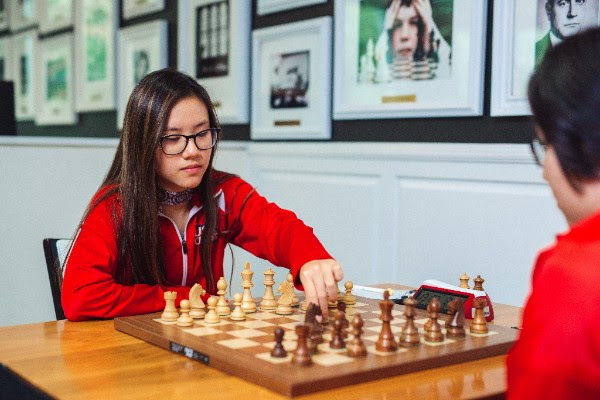 Feng sacrificed a pawn to open up the position, yet Nguyen maintained her edge into the endgame, eventually promoting a pawn. 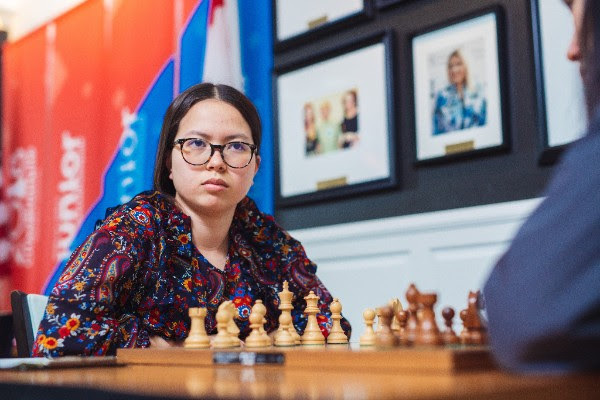 In a slightly worse position, Rochelle Wu blundered the exchange against Nastassja Matus, and Matus had no trouble converting her material lead into a win. 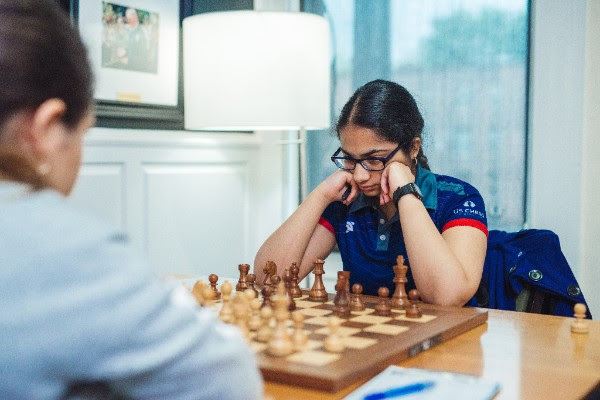 In the Nimzo Indian Defense, Thalia Cervantes gained an advantage against Sanjana Vittal by weakening her pawn structure to gain an outpost on c5. Cervantes further exerted pressure by doubling rooks to aim at Vittal’s isolated h-pawn, tying down many of Vittal’s pieces. Cervantes eventually gained a winning advantage when she broke through with her king in the endgame. Heading into round 8, Carissa Yip still leads with Jennifer Yu and Emily Nguyen trailing by half a point. Yip will have to prove herself against two of her greatest rivals over the next two rounds. She plays Maggie Feng tomorrow and then faces Jennifer Yu in the final round.